Will you go camping this summer? Here in Nova Scotia we have so many beautiful wilderness areas, many of them ideal for camping. Kejimikujik National Park is one such place, and last week our family braved the chilly evening temps and drove down to stay the night. We booked a cabin, so we were fairly cozy. Cooking and eating outdoors is absolutely my favourite part of camping. 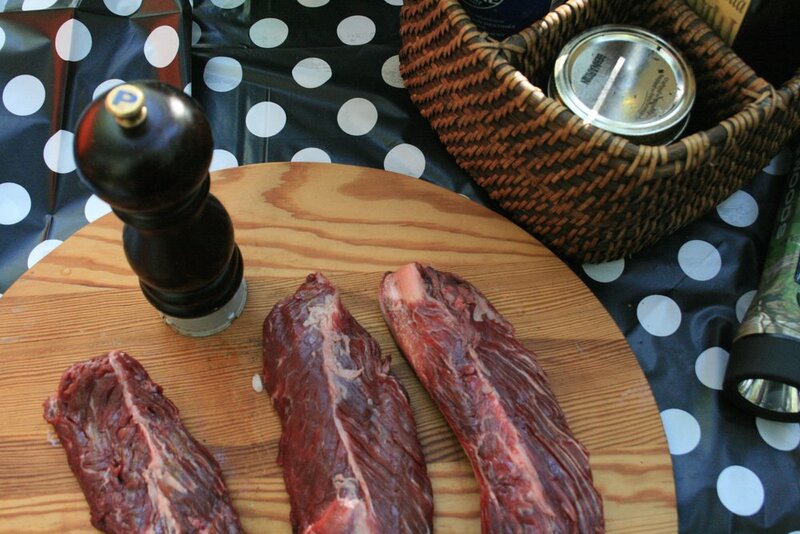 We planned a fire-friendly menu - mainly meat and vegetables - simple dishes that are easy to prepare in cast-iron. We also brought a propane stove, which we used to make delicious pancakes in the morning. Cooking using whole ingredients is a central principle of Bite-Sized Kitchen, and it's how I operate in my lessons and workshops, as well as at home during family dinner and when packing school lunches. It's easy to cook outside using whole ingredients, since they require only simple cooking. For lunch we made frankfurter-style pork hot dogs, and dinner was hanger steaks, potatoes, mushrooms sauteed in butter and tomato salad. Both of the meats we bought at Getaway Farm Butcher shop, a great place for quality meat. Hanger steaks are a very, very flavourful cut of meat, and they did well on the fire; I cooked them rare to medium rare. The kids loved helping out with the cooking. Frying food over a fire is exciting, especially when you've just helped build the fire. It's so basic, too: you can see the flame, and that's what cooks the food - it's more concrete and direct than the concept of an electric stove. And of course, one big excitement when camping is the treat of roasted marshmallows. Waking up the next morning to cook breakfast is such a joy - particularly when you've already prepped your pancake recipe. I adapted a recipe from Brooke Bass' inspiring blog Chocolate and Marrow, and she generously agreed to let me share the recipe here. Brooke's recipe suggests bringing three jars of ingredients to shake up and mix together at your campsite: flour mixture, egg yolks and buttermilk, and egg whites. They were SO good. Kids can help shake the ingredients together, and pour and flip the pancakes on the pan (with supervision, of course). It’s a good idea to pack ingredients by meal, so you only need to unpack what's required for the meal you're cooking. I recommend bringing more than one container for compost, and don’t forget oven mitts! A few essentials I would never camp-cook without include cutting board, sharp knife, cast-iron pan of at least 9", cloth napkins and tea towels, and wooden spoons. Salt and pepper, olive oil and butter are critical to almost everything you'll cook over a fire. Lemons are a great idea too - that way you have all you'll need for a salad dressing. This post is part of my collaboration with the local children's outerwear company Faire Child. I've shared it as a guest post on their blog, as well. Encouraging kids to be intrepid and independent, and helping to facilitate those skills, is a principle behind both Faire Child and Bite-Sized Kitchen. Have a look at what they do, and hope you and your family have a chance to sleep and cook outdoors this summer. Happy Trails! adapted from Chocolate and Marrow. Thanks so much, Brooke! Before you leave on your camping trip: Combine flour, salt, sugar, baking soda and baking powder in a 12-16 oz mason jar. Combine the buttermilk with the egg yolks in another 12-16 oz mason jar. Place egg whites in a third mason jar, which can be smaller (8-10 oz is fine). 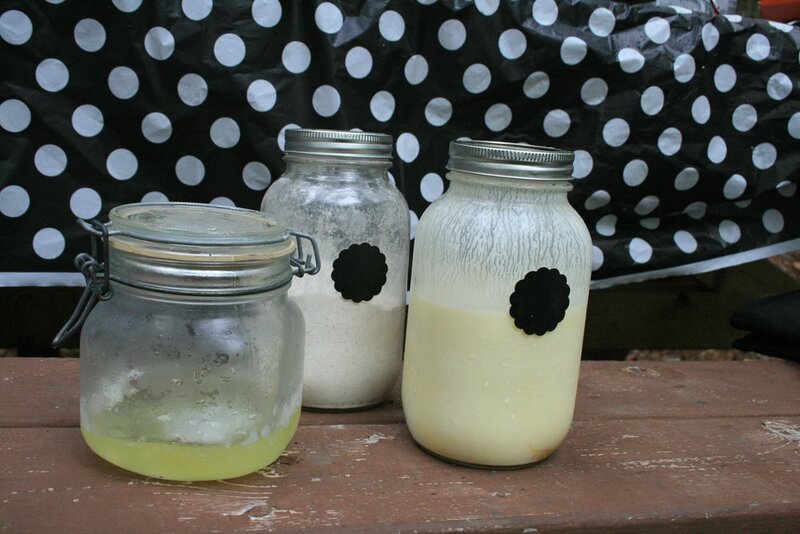 At your campsite: Shake up the jar with the dry ingredients, and the jar with the yolks and buttermilk. Pour the yolks and buttermilk into the jar with the dry ingredients, and shake again, to combine everything. Vigourously shake the jar containing the egg whites, until they become opaque and very foamy. Pour them gently into the jar containing the rest of the ingredients, and shake gently to combine (you don't want the egg whites to deflate too much). You could use a narrow wooden spoon to gently mix up the ingredients in the jar, too. 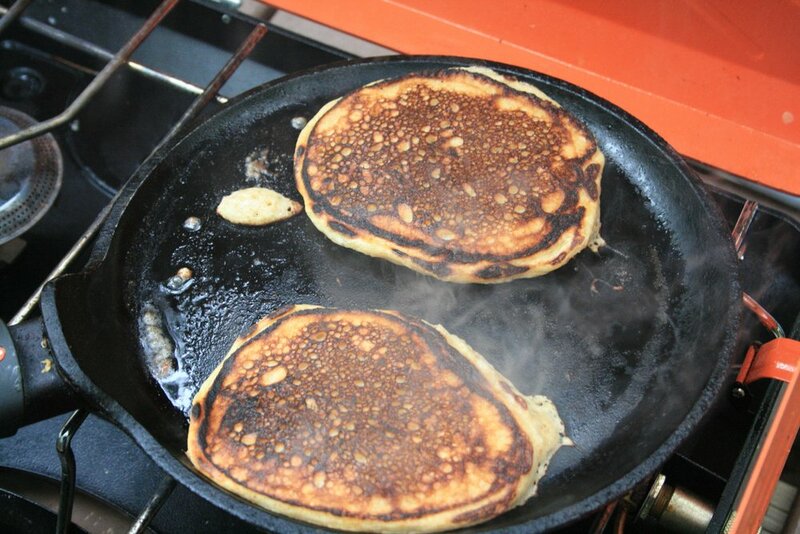 When your pan is hot, add a tablespoon of butter each time you cook a round of pancakes. Pour about 1/3 cup of batter from the jar for each pancake. Serve with my kids' favourite toppings: maple syrup and a drizzle (or pool) of cream.